Self Survey–How Are My Finances Doing? A few weeks ago, we talked about the first step in Personal Finance according to Verabear: Set your financial goals. I hope you’ve listed them down somewhere, if not, take a few minutes and do so, then come back. Now that we’ve thought about our financial goals – or maybe even our life goals – we’re ready for the next step. Before we even talk about how we get from here to there, we must first determine what the here means. Let’s take a look at the current situation – how are you doing, financially? An Emergency Fund is vital for success. The amount or how much this fund needs to be varies from person to person. Think of it as a cushion that will help soften your fall in case of emergency. Let’s say you find yourself cut off from your income source all of a sudden. The emergency fund is what will help you get through your day to day life without resorting to debt. Like I mentioned, the amount that needs to be in this fund varies, but typically, it’s three to six months’ worth of expenses. For most of us, our savings account holds the emergency fund. But an accessible savings account makes it easy and tempting to spend that money for things other than emergencies. That brand new LED SMART TV on sale might sound like an emergency, but if you dip your fingers into your EF, then it may not be so smart. Sadly, that has been the story of my life, and my bank account’s life. I bought my first iPad using money from my Savings account. When I’m short for the month’s expenses, I turn to my handy ATM and take from my Savings. As a result, I have an Emergency Fund that will probably only last a month if I find myself unemployed. It’s a story I am now changing. It makes sense to me to have a separate account for the EF, and one for short term saving. Short term saving is for big or small expenses I am saving up for. Depending on how big or small it’s going to be, it may make sense to setup separate bank accounts for each. Right now, I have my EF account, my payroll account (for my daily expenses, and short term savings too), and a Savings account for our Wedding fund. Be honest. Your success depends on how honest you can be to yourself. If you have credit cards, take at a look at your latest statement and list down how much you still owe. I do believe in credit cards being a convenient tool for financial success, but if no one tells us how to use them wisely, they end up becoming a tool that ruins us. I have three credit cards – way too much. I will soon terminate one of them, but I’ve accumulated a shameful amount of credit card debt. Honestly, I thought that the interest rate for cards were small enough. But if you think about compound interest, and that it grows each month, you realize how important it really is to payoff your credit card bill in full, each month. I’ll talk more about debts and repayment some other time. For now, let’s focus on inspecting our current situation. Apart from credit card debt, do you owe anyone anything? I owed my Dad money for my car. I’ve got about 50k left to pay, but he’s allowed me to put off payments because I now also have to pay for my medical bill from last year’s back operation. Knowing how much you owe makes it easier to plan on how much money to set aside monthly to pay them off. Have you invested on anything at all? Do you have a life insurance policy? Do you have property, or a business, anything? Is this something you’ve thought about a lot? Or are you not interested in making any investments? Investments can be an additional source of income, or it may be your passport to the future. It’s been said how keeping your money in the bank doesn’t amount to much anymore. All it is, really, is a secure way to keep your money instead of stowing them away under your bed. Investments, in contrast, grow your money. How are you growing your money? How do you want to grow your money? What’s the best investment instrument for you? I invest in stocks. I have a life insurance policy. The company I work for pays for my health insurance, and that of my parents’ too. They also took out a group insurance company for all employees. I was supposed to take out another life insurance policy a few months ago, with a mutual funds counterpart. It fell through so it’s on hold for now. Most of us mortals rely on a salary that we receive fortnightly. How much is my take home pay? We all know by now that 18k on the contract doesn’t really mean 18k in the bank monthly. How much do I get after all government mandated deductions? If you have a sideline, list it down too. Do you earn from blogging? Do you have an online shop? Do you bake cakes and sell them? List down all of the ways you make money, and how much you expect to get regularly. List down when too. Make a list of the bills you pay, how much you usually pay, and their due dates. How much do those bills amount to? If needed, is there any way to lessen the cost? Unless you already regularly take note of every single expense, you will need time for this exercise. I used to write all of my spending but I stopped it. When I decided to right some wrongs in my life again last year, I turned the habit back on. No matter how big or small the expense, record it. You don’t only need to know how much your expenses are, but what you’re spending on. My biggest expense, after the bills, has been on food. When I did this exercise I controlled my spending so I didn’t buy any clothes or shoes. Since then, I’ve had to account for budget for those things too. In the real world, I am still building a good wardrobe, clothes and shoes for my size cost a lot. These are things you don’t spend on daily or weekly, but you know you spend on it – birthday gifts, Christmas, back to school, car maintenance, etc. Though I don’t spend on these monthly, I need to factor them into my monthly budget so that money is set aside for the time they are needed. I did this a few months back and realized how much is the minimum amount I need to go through one month of expenses. If I were to go into my own business, I know how much salary I will need to make in order to make ends meet. Or how much more the boyfriend needs to earn in order to support both of us. My list may not be comprehensive. Basically, you need a very clear picture of what you have, right here, right now. Only then can you move forward with a solid plan to get to where you want to be. How are you doing thus far? Let me know how else I can improve on this post, but rest assured another one is coming up soon! Wow Vera! Feeling ko tuloy this is the answer to my prayer. How come I won’t naman kasi because now I’m listing also the things that I should do in order to save at makaahon sa mga debts – well a mistake that I did a couple of years ago. From another post in another site and now here, you talk about finances. Thank you it’s the right timing. 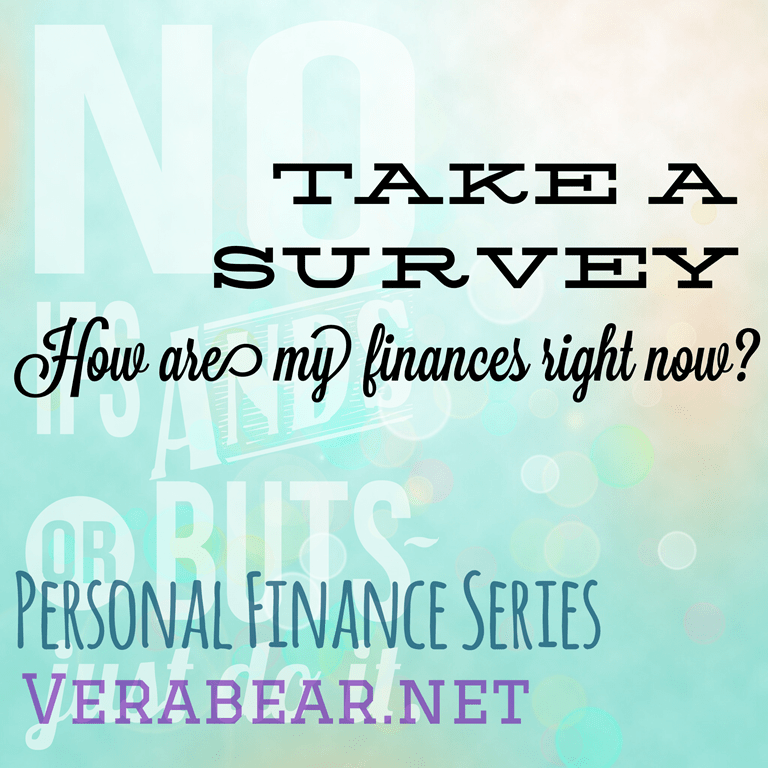 You help me think clearly about assessing my financial situation. I watch ANC on the Money a lot, and the guest there yesterday talked about listing all your expenses, which I always fail to do! (accountant pa mandin hihi. Nahihiya ako sa sarili ko if I actually jot down how much I spent for grocery when ang intention ko lang is to buy laundry soap) I was wondering what’s your take on the life insurance with mutual fund you mentioned. I used to have a variable life insurance, but some finance gurus like Suze Orman discourages getting it. She goes for term insurance then invest the rest. What do you think? Oooh I also watch On the Money. Pogi ni sir eh. heheh 🙂 I think VUL nga yun na offer sa kin, since may life insurance + mutual funds. I may be wrong. I actually like the idea, kasi may flexibility naman and after a few years, you can already get some of your earnings. Siguro okay na mag term insurance kung may oras and knowledge to manage some other investment for the rest of your money. Very well said, Vera bear!Everyone should read this…you said it all! Jhari´s last [post] ..Why Do People Still Do Bad Things? Since start of the year, Mommy is already monitoring our monthly expenses. Every single centavo is accounted. This help us track our expenses especially those unnecessary ones. Very helpful list sis. I do almost all of it and I am more than happy now with your expenses. Mahirap man, I list down all our daily expenses. May classification pa para alam ko kung saan part kami marami gastos and it turned out sa food. Okay lang naman but naiisip ko din minsan we bought so much and unhealthy food pa. Also, we used to have 4 credit cards and luckily last year we get rid of the 3 and just maintain one. We schedule purchase through credit cards too. And I always told Daddy and even Matt, that even we can afford to buy something we must determine if it’s really that necessary and we list down priorities too. Naiinspire na ko magsulat how we are doing our finances hehe. I think I have enough emergency fund for 6 months but I believe we should not stop at 6 months. I was without a job for 3 years until I created my own source of income. It is quite a challenge handling finances and we need all the help we can get (like this post). I love the way you organize the list of questions that we must answer. I’m going to need to sit down and go through it carefully. Let’s just say I need to improve. Parang gusto ko atang maiyak, waaah! Ang hirap kasi I am now a SAHM and my only source of income (sideline) are my 2 blogs, but frankly, the earnings aren’t enough. I have been praying hard for God to help me help my husband with our finances so we could raise our little boy and give him a good life. Hay, buhay. Van´s last [post] ..His Birthday Is Near! So true that we have to be honest about our expenses. Sometimes just writing them now is discouraging me to spend more. Sarap pa man din mag online shopping! Haha! ceemee´s last [post] ..Goal Achieved: January Blog Makeover, Cymplified! for Marie, Term Insurance or what we call Traditional Insurance in Sun Life is somewhat advisable to those have a big amount to invest because this is expensive BUT this is smart solution to address your various financial needs such as for retirement, child’s education, for estate preservation, income continuation, etc because WE (Sun Life) has products that give a Guaranteed Cash Benefit that you may enjoy for life! 8% of the face amount starting at the 6th year and every others year onwards..
We do have a emergency fund and from before when I was working full time I try to set aside 50% of my monthly earnings for saving for a rainy day. I think this would really be helpful, I want to improve my finances. I would always start writing my expenses, then I would stop. So, what I need is to make it a habit to write my expenses. more or figuring out more. Thanks for excellent information I used to be in search of this information for my mission.